Local racer Gareth Evans with Stanley Watson. Gareth is now racing for Stanley's Magic Bullet racing Yamaha team at the Manx Grand Prix. There’ll be some Manx magic for Lisburn road racer Gareth Evans next month, after the rider signed with Stanley Watson’s Magic Bullet racing Yamaha team to race at the Manx Grand Prix. Evans said he is ‘delighted’ with the new partnership and is looking forward to a new era with the Magic Bullet team. Just a couple of months ago the self-funded Lisburn racer had to hold a fundraising night in an attempt to compete this season. Following what Evans called a ‘very successful’ fundraiser, the local man is pleased to have agreed a deal with the Magic Bullet team to race in the junior and senior races at the Manx GP, which runs from August 20 - September 2. Gareth commented: “Stanley is a Lisburn man, his business is in Knockmore Industrial Estate. “I’ve known Stanley quite a few years, but the opportunity to race with him wasn’t there. “After the fundraiser he asked if I’d be interested in riding in the Manx GP. 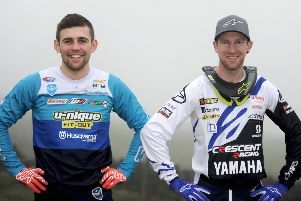 “We did the deal and I’ll be racing in the two big classes,” said a delighted Evans. “Hopefully I’ll be riding with them for next season as well. “I’m feeling really good about the GP,” Evans added. “I’ve only ever run on standard bikes, but Stanley is dedicated to all types of motorsport and he puts a lot of money into the Yamahas. “It’s going to be quite a process because I haven’t been used to high powered bikes, but I want to get used to it and get competitive. “I’m aiming for a good, safe Manx GP and use it as a building block for next year. “If you told me two months ago that five to six weeks before the Manx GP, I’d be preparing for the GP and riding for a good local team, I wouldn’t have believed it. Evans has raced at the Manx GP twice before finishing 14th and 16th in the junior and senior races. “I had a good second year,” Evans said. “I was on a standard motorbike then so I am hoping this year to break into the top ten. “When you go to the Isle of Man you can’t make a big jump because that’s a recipe for disaster, so I am taking it safe and we’ll build on it after that. Evans is currently working out in the gym up to six times a week, as well as seeing a nutritionist, to prepare for the GP. The local racer was also thrilled with the turnout at his fundraiser in May.